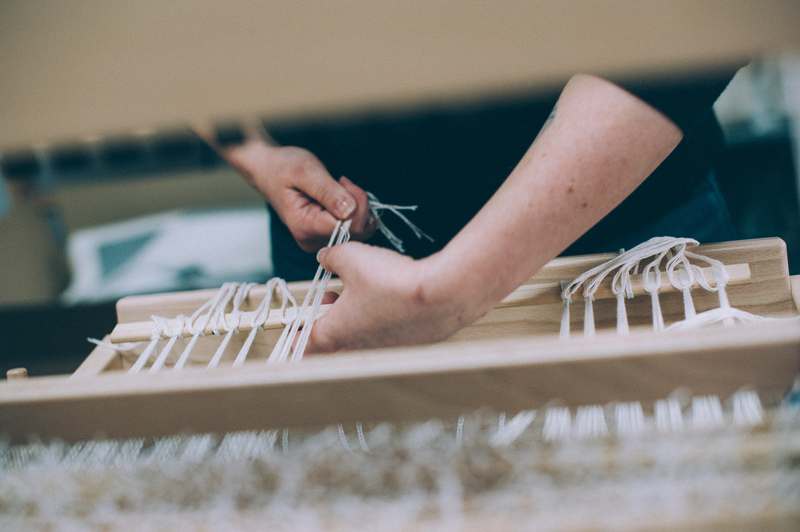 The process of weaving is rewarding both creatively and mentally, and Emma believes in sharing its value. Her weaving workshops remove the mystery behind this specialist skill, and introduce you to the unique experience of designing and building your own cloth. Emma offers three different shaft-weaving workshops, all based on your skill level, available time and budget. Simply select a workshop to learn more and book a space, or scroll down to read about all the options. If you’re curious about weaving, this is the perfect place to start! 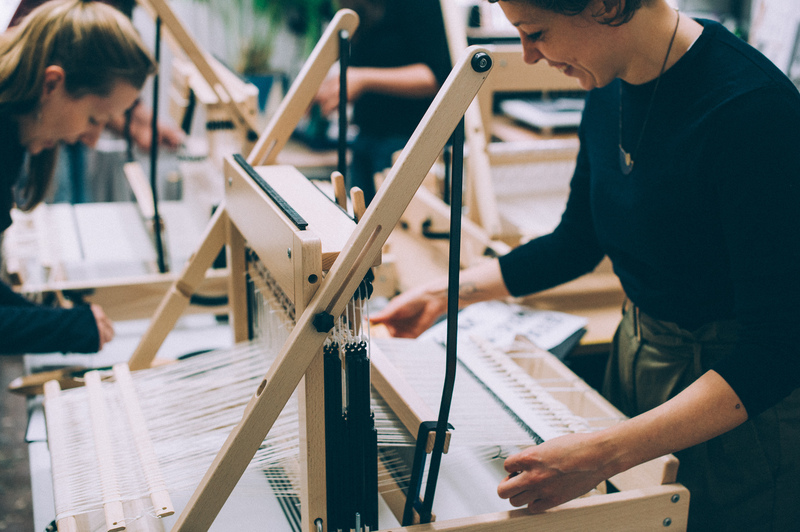 Over the course of this 4-hour workshop, you’ll have the chance to design and weave your own fabric samples on an 8-shaft loom, whilst also understanding the principles of shaft weaving. 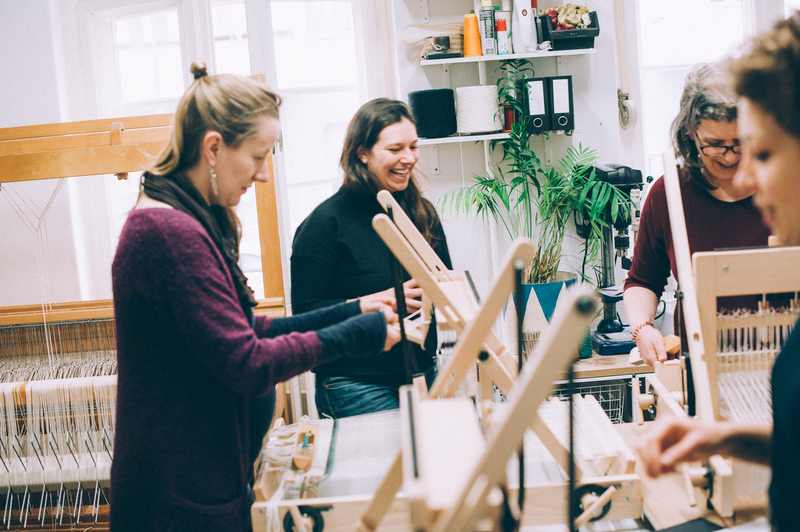 The workshop takes place in Emma’s studio, where you can select from a broad range of yarns that you can play and experiment with as you become more familiar with how weaving works. Emma will introduce you to the basic motions of weaving, help you understand how the different structures work, and explain how different warp threadings can impact your designs. If you’ve started learning how to weave on a shaft loom, and are looking for more practice (along with the chance to unwind, and get to know some fellow-weavers), then this is the perfect evening for you. Come pick up a shuttle and a glass of wine for a few hours and enjoy the rhythmic pace of weaving, and watch your cloth grow row by row! There’s no pressure to make a product, and no lesson plan – these sessions are all about freestyle weaving and doing whatever feels best for you. Emma is there the entire time to help with any questions or problems (and naturally, to join in the weaving fun!). Have you learned the basics of shaft-weaving and are itching for more?! 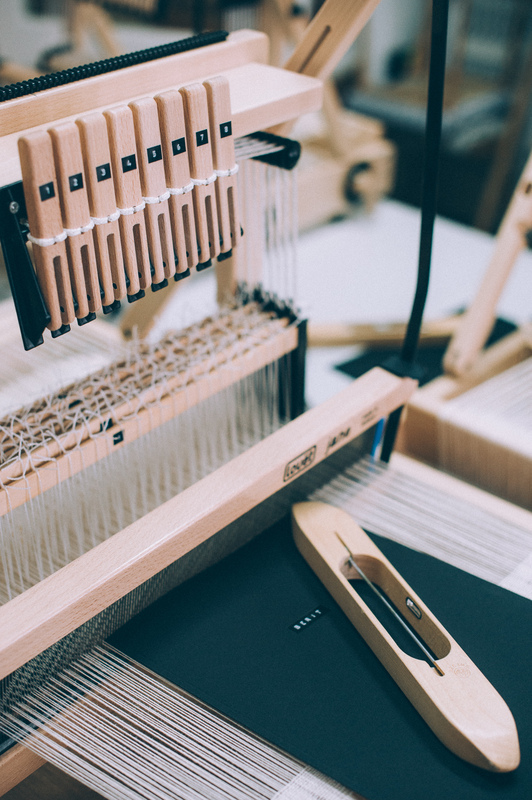 With 7 days of weaving over 2 weeks, this course is designed to deepen your knowledge and understanding of weaving, so you can start designing your own cloth from scratch. In the first week of this course you’ll choose from a selection of example warps, and then customise it to make it unique to you. You’ll then learn how to wind the warp using a warping mill, how to wind your warp onto the loom, and how to thread, reed and tie-on with a perfect tension. In the second week you’ll have up to 17 hours of pure weaving time, where you can weave your custom warp and enjoy creating your cloth at a pace that works for you. The result is a length of fabric designed and crafted from scratch entirely by you. What is “open studio weaving”? Open studio weaving is sessions where you can decide how much time you want to spend weaving at the studio. If a session is from 12:00 – 18:00, you can spend the entire time weaving, or just an hour – it’s up to you! Emma is there the entire time to provide instruction and technical support, and no one else has access to the looms during this time, the studio is reserved for you! Why are there so many “open studio weaving” sessions? Everyone weaves at their own pace, and part of the joy of weaving is finding your own rhythm that you can relax into. The open studio weaving sessions let you decide how much cloth you’d like to weave, without the pressure of a deadline. What if I haven’t finished setting up my loom by the the start of the “open studio weaving” sessions? That’s no problem – Emma is in the studio the entire time of the course, and will be there to help you prepare your loom at your own pace. What kind of items can I make from my cloth? It depends on how much fabric you weave (and which materials you use), but a few examples of items you can make are: cushion cover, pouches, tea towel, scarf, table runner or wall-hanging. What language are the workshops in? The workshop takes place in English. All weaving materials will be provided, but if you have some yarns or materials you would like to try out, feel free to bring them with you! This can be anything from thin embroidery yarn to chunky knit yarns, or even unconventional materials like metal wires. This workshop is all about play and experimentation! If you have special dietary requirements, you may also want to bring your own snacks, as we cannot guarantee the included snacks will meet your needs. How many people are in each workshop? Each workshop takes a maximum of 4 participants. I already know how to weave. Are these workshops suitable for me? If you’ve never woven before but are curious to test it out, the Weave 101 workshop is perfect for you! If you have woven before and are looking to get some more practice or expand your skills, check out the Wine & Weave and Warp & Weave workshops. The minimum age to participate is 14, however any participants aged between 14-17 must be accompanied by an adult legal guardian. This legal guardian also needs to hold a valid ticket for the workshop. The minimum age for the Wine & Weave workshops is 18. Please bring either your printed ticket, or your confirmation on your phone. How do I get to the workshops? The nearest U-Bahn station is Reinickendorfer Straße (U6). The nearest S-Bahn stations are Wedding (S42 & S46) & Humboldthain (S1 & S2). Nearby buses are the M27, 120 and 247. If you’re not able to make the workshop and want to transfer your ticket, please contact hello@wovenbywood.com so we can try to find the best solution. Can I buy a gift certificate for someone else? Yes, we offer gift certificates for the Weave 101 workshop. To purchase one, just send us an email to hello@wovenbywood.com. The gift certificate can either be collected from our studio in Wedding, or posted to you. Yes! If you’re interested in a private workshop, just contact us at hello@wovenbywood.com and we can talk about building a workshop that meets your needs. Please note each workshop is limited to a maximum of 4 participants. How can I contact you with further questions? Send your questions to hello@wovenbywood.com or use the form below and we’ll get back to you as quickly as possible.